This size fits the front and rear of Swift DB-2 (S2) and DB-3 (FC) with LD20 calipers. Note that some DB-3 cars were fitted with smaller calipers and should use the slightly smaller Brake Rotor for Swift DB-3 with LD19 Calipers (Part No.60- 3545-10). 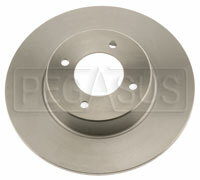 This rotor can also replace AP/Lockheed disc number CP2222-10.